Because of our firm's experience and expertise, we can provide the exceptional service expected from a large law firm but with the personal attention given at a small firm. We are technologically savvy and remain in constant contact with our clients, which ultimately saves them time and money. 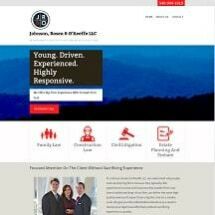 Johnson, Rosen & O'Keeffe LLC isn't like other firms. From our place of business to our friendly, high-energy lawyers, we do what we can to alleviate the stress you're feeling about your legal matter, which ultimately leaves you feeling comfortable and confident about the process ahead. We make ourselves available when you need us and we will always keep you up to date on what's happening in your case. At our firm, we accept credit cards on transactional work. We serve clients in Roanoke County and the surrounding area as well as throughout southwest and central Virginia. Call today to schedule an appointment.